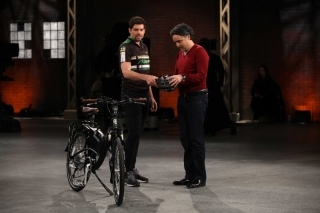 You are here: Home / Electric Bike News / Ohm Electric Bikes to be Featured on Dragons’ Den TV Show! Proving OHM’s business model that test rides sell e-bikes, the Dragons quickly saw the benefits of OHM electric bikes after probing DeVisser about the bikes and taking one for a test ride. First to try an OHM bike was Dragon Bruce Croxon, an avid cyclist whose pre-ride reaction was typical: “I’m a real cyclist – that’s an electric bike, so I can’t get any exercise on that.” DeVisser responded by explaining how OHM bikes are pedal assisted rather than completely motorized, so that riders always get exercise from pedaling, but can use the bike’s four levels of assistance to choose how easy or strenuous they want to make each ride. The dragons liked the look of the bike and liked OHM’s idea for expansion, commenting that they were not very familiar with this type of bike but liked how they reduced commuting time and helped keep pace with stronger riders. Though DeVisser cannot reveal the outcome of his presentation, he will say, “It was one of the best experiences of my life. I’m very happy to have had the opportunity to present on Dragons’ Den. Having grown up in a hilly area of North Vancouver, DeVisser recalls having to bike to the top of a steep hill to get home every day, and still remembers how difficult it was, especially after a long ride. Riding mountain bikes for much of his life, it wasn’t until he moved to China for work that he tried his first pedal assisted electric bike in Beijing, saw people using them for commuting and running errands around the city, and thought they would be very useful in hilly areas back home. The OHM team spent five years researching and testing electric bikes around the world to produce their first line of custom-built electric bikes. The company has testimonials from customers who have said that OHM bikes have changed their lives by enabling them to get back into a fit and healthy lifestyle. OHM electric bikes feature a custom designed lightweight frame, reinforced for extra strength and stability, as well as multiple frame sizes for best fit, to handle commuting and all-terrain riding. A center-mounted battery pack allows for the best weight distribution, while also being easy to install and remove, and convenient to take inside to recharge. Other quality components include an integrated LED lighting system, puncture proof tires, and hydraulic disc brakes for added safety. OHM Cycles was awarded the British Columbia Creative Achievement Award in 2009 for its custom battery enclosure. The company is a proud proponent of going green with electric bikes—an eco-friendly solution to the world’s environmental and transportation changes. Electric bikes are already being used widely for urban commuting and have commercial applications for police, security, resorts, rentals and delivery services. Electric bike sales now account for two out of every ten bikes sold in Europe. The trend is also catching on in North American markets, where electric bike sales have increased from 10,000 units to over 80,000 units in 2010, according to Frank Jamerson of Electric Bikes Worldwide Reports. DeVisser’s plan was to utilize the Dragons’ funding to purchase more inventory and roll out more OHM Factory Store Retail Outlets in Canada and the United States, to provide customers with the best service experience and the opportunity to test ride the bikes. “It takes years to develop this type of product,” says DeVisser. “We’ve been in business since 2005 and have established our brand as a high quality supplier of electric bikes. 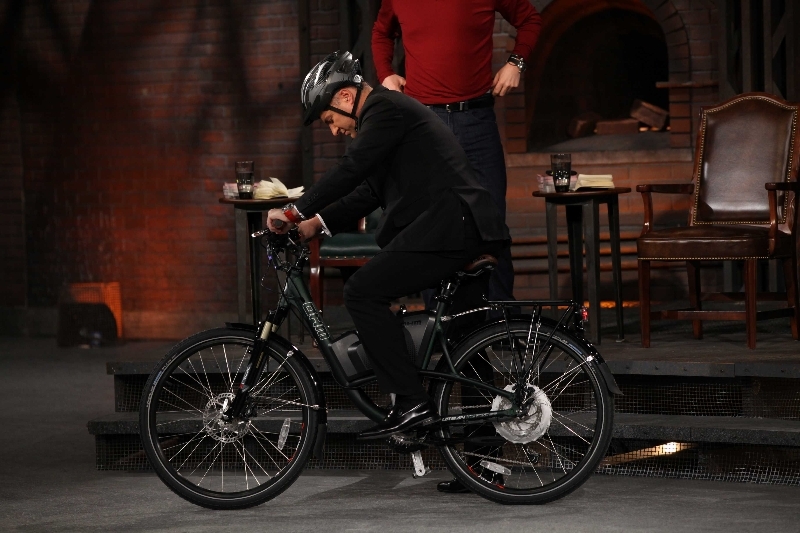 We hope our appearance on Dragon’s Den will inspire people to test ride our exclusive design and experience firsthand the freedom that comes with riding an OHM bike. DRAGONS’ DEN is the highest rated Canadian unscripted program on television, with an average audience of over 1.4 million Canadians each week. In addition to its success on-air, DRAGONS’ DEN is also a hit online, boasting an active and engaged online community averaging more than 650,000 page views per month. Full episodes and exclusive behind-the-scenes content can be viewed at cbc.ca/dragonsden. No mention at all about where the motor assist system actually comes from or credit to the Bion X company ? cant wait to see the show! One sunny day last summer at 2pm in afternoon.. On the full suspension -Ebike I built (SolarCross) with close to same capacity of battery, I road up rocky gravel roads from Squamish, B.C. to Elfin Lakes, approximately 1600ft drawing as close to 100watts as I could from the battery pack feathering the trottle the whole way.. took me about 3 hours. And I didn’t even bother bringing any food, just 700ml of H2O.. Up and back down in under 5 hours.. thats with a lesser power efficient brushed motor to boot..
Hi Ken, Yes our bikes use Bionx! We were not allowed to use other trademarks since we had to sign a release for this show! Good to see ebikes get exposure time any where they can get it. Just gotta price it $1000-$1500 and they could sell very well.